Who is starting at tackle? This is the first question the Seahawks have to ask. The key to the draft is the future of Russell Okung. With Cordy Glenn getting the franchise tag and reports today that the Raiders are intent to lock up Donald Penn — Okung is probably going to receive a sizeable offer from another team. Even Mitchell Schwartz is being touted as an $8m APY tackle. The chances of keeping Okung or finding a replacement in free agency appear limited. But isn’t it a great D-line class? It’s a very deep class but it lacks more than a handful of exceptional athletes. There will be players you can get at #26 and #56 with similar grades. You can even find a good option in rounds three or four. Bang the drum for a defensive lineman at #26 if you want. The smarter move is probably to use the depth to your advantage. The depth at offensive tackle is far weaker and if you don’t take one in the first frame — you risk missing out. So what about this tackle class? There’s an exceptional chance the top five (Tunsil, Stanley, Conklin, Spriggs and Decker) will be off the board by Seattle’s pick. Such a scenario would leave three genuine candidates — Shon Coleman, Germain Ifedi and Le’Raven Clark. Coleman didn’t work out at the combine but plays with a tremendous edge, has battled adversity like nobody else in this draft (cancer survivor) and has excellent size/length (6-5, 307lbs, +35 inch arms). Ifedi gets a bad press in the media but he has incredible upside and the potential to play either tackle spot or left guard. He’s pushing 6-6 and 324lbs with 36 inch arms. This is the profile of a Seahawks offensive tackle based on their draft history. Greg Robinson hasn’t lived up to expectations as a pro but he was considered an athletic monster at the 2014 combine. Ifedi had a superior vertical by four inches, a broad jump that was only three inches shorter and his short shuttle was 0.10 quicker. Clark had a good workout at the combine and he’s an athletic 6-5, 314lbs with +36 inch arms. Again — size and length is Seattle’s profile. He’s technically poor but has the ceiling of a top-five tackle in the league. A team with a good O-line coach might fancy their chances of turning Clark into a stud. These three ‘fall-back’ options might not sound all that appealing. The alternative — not taking a tackle and putting Justin Britt back on the right — might be even less appealing. Coleman, Ifedi and Clark don’t carry anywhere near as much hype as the D-line class but it’s rare to find this combination of length, size and athleticism at offensive tackle in the late first round. To find it in three players? That’s not to be sniffed at. What about the defensive linemen? I’m not sure about the talk of needing to go D-line at #26. That’s somewhat missing the point on the class. It’s not that the options in round one are particularly fantastic. It’s the overall depth and quality. There could be +30 prospects carrying grades in rounds 1-3. Pete Carroll noted to Pat Kirwan that they’re looking for players that can force turnovers. The one big complaint about this deep D-line class is its lack of quick-twitch pass-rushers (edge or interior). Emmanuel Ogbah can impact plays and had 13 sacks in 2015 — but his motor is wildly inconsistent. The Seahawks spoke to him at the combine and with good reason. Has he got the grit-factor? He and Charles Tapper were the only two D-liners to run an elite 1.5 10-yard split. These two are the most intriguing edge rushers in the class with length (Ogbah 35.5 inch arms, Tapper 34.5 inches) and size (Ogbah 6-4, 273lbs, Tapper 6-3, 271lbs). Ogbah also had a 35.5 inch vertical, a 10-1 broad jump and a 4.62 forty. Tapper had a 34 inch vertical, a 9-9 broad jump and the quickest forty among D-liners (4.59). They both flash on tape. According to Bob McGinn’s anonymous source, Ogbah could be available in the late first round. Tapper is likely a second round selection. If you feel comfortable with Ogbah’s motor and you’re able to find a solution at offensive tackle (or keep Okung) he makes sense at #26. Jonathan Bullard had a better than expected workout, testing well among potential interior candidates. On tape he looks most comfortable as a five-technique. McGinn’s source suggests he’ll be available in rounds 2-3 and despite his performance in Indianapolis that grade seems pretty accurate. His best fit might be at DE in a 3-4. There were several disappointing performances including Adolphus Washington and Chris Jones. Kenny Clark likely bolstered his stock with a good performance and looks like an early second round pick as a pure one-technique. Michigan’s Willie Henry could also provide some value — and Javon Hargrave continues to be an intriguing smaller school option. Seattle drafted Jordan Hill in round three with a 5.23 forty (1.75 split) and a 22.5 inch vertical. He did have a decent 4.51 in the short shuttle. The Seahawks seem less concerned by SPARQ stars on the D-line once they cross the third round threshold. Keep an eye on Washington if he falls into round three — he’s a better pass-rusher on tape than he is a combine warrior. Two others players are pretty interesting. Shaq Lawson is 6-3 and 269lbs with 33 inch arms. He had a fairly average forty (4.70) but had a fantastic three-cone and short shuttle. His ten-yard split time was 1.64. Carl Nassib is 6-7 and 277lbs with 34.5 inch arms. He ran a nice 1.62 split for his size and a good 4.37 short shuttle and 7.27 three cone. He did only jump 28.5 inches in the vertical though. Both players were productive in 2015 (Lawson 12.5 sacks, Nassib 15.5). Lawson could be a late first or early second round pick. Nassib could go in the third or fourth round. Based on the combine workouts there’s really only three options — Derrick Henry, C.J. Prosise and Kenneth Dixon. Henry could be off the board by #26 and probably won’t appeal as a first round candidate. Dixon is being graded in rounds 2/3. Prosise might be available in the late third. The Seahawks have a definitive size ideal at running back and demand a certain level of athleticism and toughness. Alex Collins (4.59, 28.5 inch vertical) and Paul Perkins (4.54, 32 inch vertical) didn’t really make any waves. Prosise has the size (6-0, 220lbs), speed (4.48) and explosion (35.5 inch vertical) they seem to like. Dixon isn’t far behind at 5-10, 215lbs with a 4.58 and a 37.5 inch vertical. Both players are useful in the passing game and finish their runs. Indiana’s Jordan Howard and Utah’s Devontae Booker didn’t workout so we’ll need to see how they test at their respective pro-days. While they might feel obliged to draft the best available offensive tackle at #26, they could have a ton of flexibility at #56. The D-line class is deep enough to wait until round three if they want to. That could open the door for a receiver (Braxton Miller? Sterling Shepard?) an interior offensive lineman (Christian Westerman? Connor McGovern?) or another position. The Green Bay Packers consistently draft receivers in round two and the Seahawks have used some of that philosophy with John Schneider. Golden Tate (2010) and Paul Richardson (2014) were both second rounders. They traded up in 2015 to take Tyler Lockett in the early third round. With some uncertainty over Jermaine Kearse’s retainability, Doug Baldwin being a free agent next year and Paul Richardson’s injury concerns — it wouldn’t be a total surprise if they considered someone like Miller or Shepard in the late second. What about a defensive playmaker? The one player I couldn’t get off my mind yesterday was linebacker Travis Feeney. This is a guy who had eight sacks in 2015, has terrific size and length (6-4, 230lbs, 33.5 inch arms) and just exploded at the combine. Feeney ran a 4.50 with an elite 1.59 split. He also had a 10-10 in the broad jump and a 40-inch vertical. According to Rand Getlin, he was also suffering with a hernia. Imagine if he was 100% healthy? That’s part of the issue with Feeney — his health. He’s had multiple shoulder surgeries and who knows how he checked out medically in Indianapolis? If he got the all-clear — he could go much earlier than people expect. In a class lacking genuine explosive athletes with freaky length and size — Feeney is a diamond in the rough. Health permitting, it wouldn’t be a surprise if the Seahawks took him a lot earlier than expected to fill the hole left by Bruce Irvin. And the interior offensive line? Missouri’s Connor McGovern is 6-4, 306lbs with 33 inch arms and he put on a show with a 1.72 split, a 33 inch vertical and a 4.65 in the short shuttle. The Seahawks like their Mizzou O-liners and McGovern could easily find himself in Seattle to play guard or center. South Carolina’s Brandon Shell could be a classic Tom Cable tackle-to-guard convert. He has the size Seattle likes at left guard (6-5, 324lbs) with 35 inch arms. Shell ran a 1.75 split and managed a 30.5 inch vertical. Michigan center Graham Glasgow also had a good workout posting a 1.76 split and a 4.63 short shuttle (both excellent). He’s 6-6, 307lbs with 33.5 inch arms and nearly 11 inch hands. He’s the definition of gritty and hard-nosed. He’s also almost identical in size to Max Unger (with longer arms). The Seahawks quietly have a deep crop of up-and-coming corners. Because of the technique they teach it’s difficult to pick it up and start quickly. Even a veteran like Cary Williams struggled badly with the adjustment. Tye Smith, George Farmer, Stanley-Jean Baptiste, Mo Seisay, Marcus Burley and Tharold Simon could all compete in camp. There’s also a chance they retain Jeremy Lane and DeShawn Shead will be with the team in 2016. This looks like another 5th or 6th round job — if at all. We also know the Seahawks like length and size and are unlikely to draft any cornerback with sub-32 inch arms. Richard Sherman ran a 4.56 with a 38 inch vertical at 6-3, 195lbs. Justin Simmons is the best comparison physically and athletically, although he played safety at Boston College. Some people are ranking Simmons in day two after he beat Byron Jones’ long shuttle time. Byron Maxwell ran a 4.46 with a 33 inch vertical at 6-0, 202lbs. Daryl Worley is similar physically but ran a much slower time. Late round or UDFA sleeper? We’ve talked a lot about Tennessee receiver Marquez North. He burst onto the college scene as a major recruit and just as quickly disappeared. A change of regime, injury and inconsistency led to a disappointing career for the Vols. North still showed flashes of genuine talent. With the right mentor and pro-coaching he could be a great project for someone. North ran a 4.48 at 6-2 and 223lbs. He has a big catch radius (33.5 inch arms) and had a 35 inch vertical. He also shone in the short shuttle (4.13). As you can see, there’s some nice speed, explosion and length above. Eric Murray, James Bradberry, T.J. Green, Deiondre Hall, Justin Simmons and Daryl Worley could be nice options later in the draft. 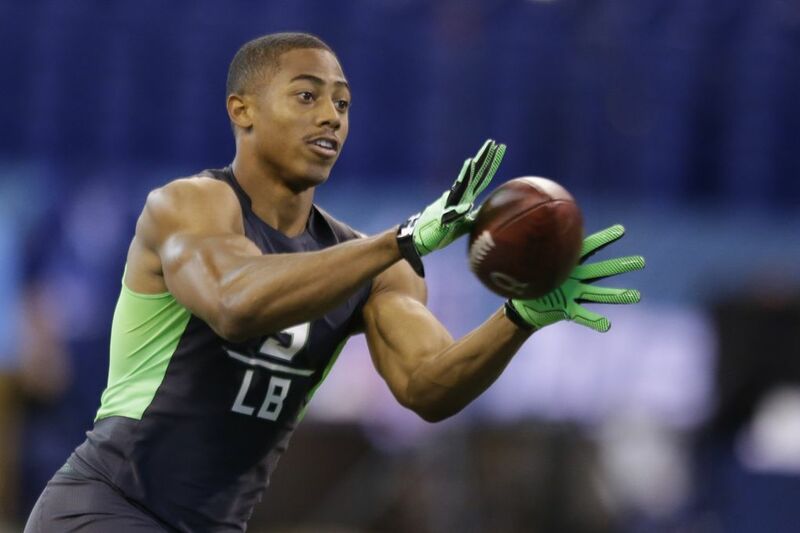 Vernon Hargreaves only ran a 4.50 at 5-10 and 204lbs with 30.5 inch arms. He’s not a great speed guy to go with limited size. He looked very natural in the drills. He did have a 10-10 broad jump. Eli Apple ran a 4.40. For me he’s a superior talent to Hargreaves. 41.5 inch vertical and an 11-3 broad for Jaylen Ramsey. There you go. Keanu Neal had a 38 inch vertical and an 11-0 in the broad. That is special too. He’s a first round lock. Seahawks interested in Germain Ifedi at #26? Tony Pauline says the Seahawks and Broncos are targeting the Texas A&M tackle in round one. This shouldn’t be a big surprise to anyone. Ifedi is basically the prototype offensive lineman for Seattle. He’s nearly 6-6, 324lbs and has 36 inch arms. They love size and length. Russell Okung has 36 inch arms, James Carpenter was 325lbs, so was Justin Britt. Three players drafted by the Seahawks in the first two rounds. This is their profile for an offensive lineman taken early. There’s a lot of negativity about Ifedi in the media but he carries a ton of upside and can play right tackle or left guard for the Seahawks. It won’t be a pick that’ll get many people excited — but it makes a ton of sense. At the combine he had a 32.5 inch vertical — second best among offensive linemen. If they’re unable to re-sign Russell Okung they’ll need to do something at tackle. Free agency could be expensive. The D-line class is deep enough in this draft to find an option in rounds 2-3 (more on that in a bit). You might not be able to find an offensive tackle you like after round one. Tunsil, Stanley, Conklin, Spriggs and Decker are all likely to be off the board at #26. If you don’t take Ifedi or Shon Coleman or Le’Raven Clark — you run the risk of missing out. It’s probably not what Seahawks fans want to hear — but that might have to be the direction they go in round one. He had some nice college tape at Oklahoma — but nobody expected this performance. Tapper is 6-3, 271lbs and has 34.5 inch arms. He’s big and long. Today he ran the quickest time in the D-line class with an official 4.59 and a 10-yard split of 1.59. Anything in the 1.5’s is elite — and Tapper backed it up with a 34 inch vertical and a 9-9 in the broad jump. In the drills he looked great working in space — and took part in the linebacker exercises. He had quick feet and changed direction easily. He excelled in the mobility drills going around and over the bags. He could’ve used a bit more knee bend in the punch drill but he showed great force and balance. He had seven sacks in 2015 — all in the last six games. He can play inside or out and was moved all across the defensive front by Oklahoma. If the Seahawks want to add an impact pass rusher — Tapper could be a great option. On tape Ogbah slouches around and plays with inconsistent effort. Even with a 13-sack season he looked like a mid-rounder. After this performance — teams are going to be doing a ton of work on his motor and passion for the game. He had a 35.5 inch vertical, a 10-1 broad jump and a 4.62 forty with a 1.59 split. Again — anything in the 1.5’s is elite. It’s what the Seahawks have gone for in an edge rusher (Avril 1.50, Irvin 1.55, Clark 1.59). Ogbah revealed he met with the Seahawks in Indianapolis and it’s perhaps no surprise. He has the physical skills — but does he have the heart and the grit? His tape leaves a lot of questions in that regard. He was silky smooth in the drills, moving very easily and looking fantastic at 6-4, 273lbs and with 35.5 inch arms. Physically he’s an absolute stud. The size, length and athleticism is worthy of a top-10 grade. Can he convince teams he wants to be great? D-line class a bit overhyped? There’s some nice depth in the class and you’ll be able to find impact players well into rounds three and four. That said, all we’ve heard about is the brilliance of the D-liners. There simply aren’t many special players in the group. Joey Bosa is only a 4.86 runner with a 1.69 split and a 32 inch vertical (although he performed well in the agility tests, highlighted by a 6.89 three-cone). Noah Spence — a one-dimensional speed rusher — ran a surprising 4.80 with a 1.62. They could be top-15 picks but are well off some of the more athletic D-liners to enter the league in recent memory. Tapper and Ogbah were the only two defensive linemen to record a split in the 1.5’s. If you’re looking for a really athletic, explosive edge rusher — good luck. It’s not a class rich in quick-twitch pass-rushers. Carl Nassib — one of the better runners at 4.84 and a 1.62 split at 277lbs — had only a 28.5 inch vertical. Florida’s Jonathan Bullard was probably the most impressive interior D-lineman — and yet you can make a very clear case to ask if he’s that much better in round 1-2 compared to a Willie Henry in round 2-3? Robert Nkemdiche had a nice, athletic workout as expected — but can you trust him as an early pick? Shaq Lawson tested well for his size. Here’s how I’d describe this class. It’s abnormally deep with around 27 players you wouldn’t mind drafting in the first two days. Yet there’s a dearth of unique speed and athleticism (the thing the Seahawks love) and the difference between the top-10 and the rest is minimal. I’ve seen it suggested that the Seahawks would be making a mistake not to tap into this class at #26. That, to me, is buying into the hype. Seattle can find better value in rounds two or three on the D-line unless the likes of Sheldon Rankins or Emmanuel Ogbah drop (which seems unlikely after today). Who do you have to have at #26? Who can’t you live without from this D-line class? Seriously? The medical checks will be critical for Feeney — but he had a tremendous workout. At nearly 6-4 and 230lbs he ran a 4.50 with a 1.59 split. He also had a 10-10 in the broad jump and a 40-inch vertical. That’s Seahawky. Rand Getlin also reported he was suffering with a hernia — making his performance all the more impressive. He’s a legit candidate to come in and replace Bruce Irvin if he can prove his health. He’d be a great fit in Seattle and would offer some nice special teams value too. He could be worth a fourth round pick. Leonard Floyd ran a 4.60 with a 1.60 split and jumped 39.5 inches in the vertical. That should be enough to get someones attention in round one. Kyler Fackrell didn’t quite crack the 1.5’s in his split (1.62) and ran a 4.72. That’s still good enough for someone to take a chance on him working the edge. He had a 34.5 inch vertical. We’ve had Darron Lee marked as a top-12 pick for some time and he ran a 4.47 with an elite 1.55 split. He makes a huge amount of sense for the Giants at #10 and maybe even the 49ers at #7. If you want a sleeper pick to dig into — check out East Carolina’s Montese Overton. He ran a 4.61 with an elite 1.59 split. He could also be a hybrid edge-rusher/linebacker. He jumped 34 inches in the vertical which is good but not great at 6-2 and 223lbs. LSU’s Deion Jones didn’t get into Lee range and that likely ends any first round talk. His best time was a 4.59 with a 1.60 split. He only had a 33 inch vertical. Su’a Cravens chose not to run a forty yard dash and only jumped 27 inches in the vertical. Not good. — Which DE’s run a 1.5 10-yard split? That’s the elite bracket. Cliff Avril (1.50), Bruce Irvin (1.55) and Frank Clark (1.59) all ran in the 1.5’s. — Which defensive tackles have the athleticism to work the pass rush at the next level? It’s a deep class for DT’s — but not necessarily for pass rushers. Can anyone separate with an athletic workout and a fast split? — Are there any second or third tier linebackers with extreme speed? The Seahawks have looked for speed in the front seven and their last linebacker pick — Kevin Pierre-Louis — had a fantastic workout. He’s 6-4, 251lbs and has 34 inch arms. At the 2008 combine, Cliff Avril measured at 6-3, 253lbs. Both players had underwhelming college careers in the Big-10. Avril was the #92 overall pick and the Seahawks own the #90 pick this year. Can Calhoun run a 4.51 like Avril with a split in the 1.5’s? If so, he could be on Seattle’s radar in rounds 2-3. Incredible effort and mobility for his size. Johnson weighed in at 314lbs which is a bit lighter than the Senior Bowl. Underrated pass rush ability. Could easily work into the late first with a great workout here. Has the attitude Seattle loves. Arguably the best interior pass rusher among the DT’s, Washington had an inconsistent career at Ohio State. He has the length (34.5 inch arms) and similar physique and style to Malik Jackson. Can he put on a show today? At 6-4, 323lbs and with 35 inch arms — he compares physically to Muhammad Wilkerson. On tape he’s a far weaker pass rusher. Wilkerson ran an impressive 4.96 with a 1.73 split at 315lbs. If Butler gets into that range teams will take notice. A one-year wonder at Clemson, Dodd has terrific size (6-5, 277lbs) and length (34 inch arms). On tape he doesn’t appear to have an explosive get-off so can he explode with a great split time and put in an athletic performance? Like Dodd, Ogbah has ideal size and length (6-4, 273lbs, 35.5 inch arms) but his effort in college was below average. He blew hot and cold a lot and teams will need reassuring he can be an explosive edge rusher. He’s a bad dude — he looks about 33 years old already (he’s only 20). Robinson is built uniquely with minimal bad weight on a 6-4, 307lbs frame with 34.5 inch arms. He’s a Greek God. He’s passive on tape and needs to play with greater aggression at the next level. Tall and productive in 2015, Feeney’s shoulder injuries could stall his pro-career before it even begins. If teams are comfortable with the medical checks he has a shot to make it in the NFL. He’s good on special teams and could contribute at linebacker in a rotation role initially. A good workout helps him. He plays with his hair on fire and impacts games. He’ll get into the backfield and make life uncomfortable for a QB. He’s a bit of a tweener in terms of size. He’ll need to run a 1.5 split to get into contention. He’s 6-3, 249lbs and has +34 inch arms. He didn’t look like a special athlete on tape but he’s a high character, high intensity edge rusher. Like Fackrell he needs to target the 1.5 split range. Lighter linebacker who moves well and plays the run. Had five sacks and a pick six in 2015, plus 99 tackles. Needs an explosive workout given his size. Other names to keep an eye on: Jonathan Bullard (DT), Javon Hargrave (DT), Willie Henry (DT), Darius Latham (DT), Chris Jones (DT), Shaq Lawson (DE), Sheldon Rankins (DT), Jihad Ward (DE), Leonard Floyd (LB). Fletcher Cox in 2012 ran a 4.77 with a 1.65 split at 6-4, 297lbs. Seattle probably passed on him due to a 26 inch vertical. None of the big guys at 300lbs ran as well as this in group one. Frank Clark, who they did draft, ran a 4.64 with a 1.59 split at 6-2 and 271lbs. Michael Bennett ran a 1.62 split as his pro day. The first group confirmed what we really knew about the class. It’s deep — but mostly filled with big guys and not quick-twitch pass rushers. Jonathan Bullard’s 1.66 split is the highlight of the first group — but he is lighter at 6-3, 285lbs. The Seahawks drafted Jordan Hill in round three with a 1.75 split. Bullard and Vernon Butler looked really quick in the bag drills. Great footwork, light on their feet. Willie Henry, DeForest Buckner and Chris Jones looked nice and quick on the speed-to-power drills, striking the bags and rounding the edge. On the punch and shuffle, emphasising pad level and mobility, Andrew Billings looked terrific. Bullard received warm praise from the coaches for his effort but he looked a little tight in the hips. Kenny Clark and Willie Henry were naturally good in this drill. Chris Jones was quick but struggled to bend his knees and punch. In the lateral agility test, Kamalei Correa looked really good — as did Willie Henry. Overall I think Henry is doing a great job. Vernon Butler moves very well for his size. From group one, Henry, Jones, Correa, Bullard, Day and Clark probably did the most to help their stock. Now we’re talking. Emmanuel Ogbah, who met with the Seahawks in Indianapolis, ran a 1.5 split at 273lbs. Carl Nassib had a 1.62 at 277lbs. That’s more like it. Charles Tapper a 1.59 with a 4.59? At 271lbs, 6-3 and 34.5 inch arms. Fantastic. I’m buying whatever he’s selling. This was a good second group. Ogbah had 13 sacks in 2015, Nassib 15.5 and Tapper seven. Production + athleticism + grit usually works for Seattle. All three ran well with the necessary 10-yard split to be interesting. Ogbah’s effort on tape is inconsistent. He had a 10-1 broad and a 35.5 inch vertical. It was a disappointing performance by Noah Spence — a 4.80 and only a 1.62 split. It’s decent but not great for a guy his size. Spence is a one-dimensional guy — he has to win with speed. He didn’t light it up here. Adolphus Washington had a poor run. Sheldon Rankins’ was decent but not great. Shaq Lawson can be pretty satisfied with his run considering he’s not a speed guy (4.70, 1.64 split). Ogbah and Rankins looked very smooth in the agility drills. Spence shone here with a great back pedal. Tapper is wowing everyone here. Another terrific drill — quick feet, changes direction nicely. Intense. Nassib doesn’t move as well in space with change of direction. More of a straight-line guy. Ogbah is in fantastic shape. Nice, long frame. Moved around the bags well enough. Sheldon Rankins showed good balance and movement. A’shawn Robinson stumbled over the bags. Spence looked good — while Tapper again looked tremendous. Big movements, shifting around the bags. Tony Pauline has just posted a piece suggesting the Seahawks are targeting Germain Ifedi in the late first round. He fits their size ideal at right tackle or left guard. Power-to-speed drills — Ogbah looking real fluid again. Great workout. Smacked the bags and gets round the edge with burst. I didn’t expect to be this impressed with Ogbah. Hassan Ridgeway was good in the punch drills. Nice bend and arm extension. Power. What a surprise — Tapper looked great again. Perhaps could’ve used a little more knee bend (a coach highlighted it) but he had great power and balance. He just looks great. Tapper even looked good running linebacker drills in space. Some of the D-line vertical jumps were awful today to go with some mediocre times. We’ll get into this in the review piece later. Decent time for Kyler Fackrell who ran a 1.63 split. Great time for Travis Feeney too with a 1.59 and 4.50. He also had a 10-10 in the broad jump and a 40-inch vertical. That’s Seahawky. Leonard Floyd had a nice 1.60. As far as underwhelming combine days go — this was right up there. Is this a defensive draft? Absolutely based on the way the skill positions performed on Friday and Saturday. If you want to know why the Seahawks are firmly keeping hold of Jimmy Graham — this is why. It’s a horrible tight end class again. Graham, even coming off a significant injury, is a far superior option than anyone in this draft. The receivers are mostly slow or average (or both) and the top quarterback trio (Lynch, Wentz, Goff) look like guys you prefer to admire from afar. If you’re a fan with Russell Wilson leading your team they probably seem pretty good. I’m not sure, however, if you’d be quite so thrilled if you were pinning your hopes on any of the three winning you a Championship over the next decade. The running backs yesterday had a couple of highlights (Ezekiel Elliott and Derrick Henry) but some of the second tier options were very average. C.J. Prosise and Kenneth Dixon are probably battling to be the next guys up. There are some nice options on the O-line — but the star power is mostly on defense. After running a decent 4.50 at 6-2 and 202lbs — Doctson followed it up with a 41 inch vertical and a 10-11 broad jump. He’s not the longest player (31 7/8 inch arms) but on tape he does a good job adjusting to the ball and making difficult grabs. He’s a nice compliment of reasonable size and explosion (he does turn 24 this year). He could be an early second round pick depending on what teams are looking for. If you want speed you go Will Fuller, if you want a bit more size you take Doctson. Bring on the comparisons to Tyler Lockett. Shepard was incredibly reliable in college but needed to flash some athleticism here. Job done. After running a 4.48 he jumped 41 inches in the vertical. That’s a nice combination and could secure a second round grade. We highlighted North as a later round option — or even an UDFA option. At 6-2 and 223lbs he ran a 4.48, jumped 35 inches in the vertical and had a 10-3 in the broad. North is pretty much the receiver version of running back Keith Marshall. They were both highly rated recruits flashing major talent early in their college careers. Now they’re starting over in the NFL after some struggles and injuries. North also caught the ball very well during drills, presenting his hands to the quarterback. Nothing represents the rampant mediocrity of the day better than these two. Williams, who was kicked out of Auburn, claimed he was a first round talent with seventh round character earlier in the week. After running a 4.72 he might want to rethink the self-scouting. Wilson was even worse — running a 4.85 and posting a ridiculous 28 inch vertical. He’ll sink like a stone unless a legit injury issue emerges. Corey Coleman didn’t run a forty but jumped a 40.5 inch vertical. He’s an explosive athlete who makes big plays. Laquon Treadwell is sturdy and looks in great condition — he’s just not a speed guy. That’s your top two. After that? It could be anything. Josh Doctson and Will Fuller maybe stole a march on Michael Thomas and the rest. Sterling Shepard is closing the gap. There wasn’t a great deal to separate the top three. Carson Wentz, Paxton Lynch and Jared Goff all looked fairly comfortable. Lynch was perhaps a little weaker in terms of accuracy during the throwing drills. He also arguably has the greater physical upside — jumping a 36 inch vertical at 6-7 and 244lbs. In comparison, Andrew Luck also jumped a 36 and Cam Newton had a 35. Wentz managed a 30.5 inch vertical and Goff a 27. Lynch presents an intriguing skill-set. Wentz and Goff might be deemed ‘safer’ prospects — but neither has Lynch’s upside, size, arm strength and athleticism. The combine buzz seems to indicate Wentz will be the first off the board. What about the next group? Christian Hackenburg has some of the physical traits you like but he was all over the place during drills today. His accuracy was well off — even standing in shorts throwing to open receivers. Connor Cook looked OK — pretty much how he looked in college. Good but not great. Nobody else really stood out as a nice developmental guy to work behind Russell Wilson. The Seahawks won’t take cornerbacks with sub-32 inch arms. There’s always a chance they make an exception for an exceptional athlete. Eli Apple and Mackensie Alexander don’t appear to have the dynamic athleticism to combat a lack of length. Xavien Howard? We’ll see. We’ll find out for sure on Monday when the DB’s work out. Apple and Mackensie have 31.5 inches arms, while Howard’s are 31 inches. It’d take an amazing athlete for the Seahawks to consider a corner in the first frame regardless. They’re unlikely to find one at #26. On tape he bites on double moves, gambles way too much and is a poor open field tackler. Yes — he’ll probably have a great work out on Monday. At 5-10, 204lbs and with 30.5 inch arms — can you seriously put him out wide? People love to compare Hargreaves to Joe Haden — but Haden has 33 inch arms and was far more polished. Hargreaves looks like a pure slot corner. Which is fine — he could be a very good one with explosive athleticism and a nose for the ball working across the middle. It’s a nice fit. But how early are you willing to take a slot corner? Bradley Roby was the #31 pick in 2014. I still think there’s a chance Hargreaves drops into that kind of range. We highlighted him a couple of days ago as a possible option at #26. That talk isn’t going away. Neal is almost identical in size to Deone Bucannon (6-0, 211lbs) but he has superior length (33 inch arms). Length, speed, athleticism, grit, tenacity — it’s everything the Seahawks look for. I sense some scepticism about taking a ‘deathbacker’ (hybrid S/LB) in the first round. I get that. There are bigger needs today on the O-line and D-line. If they’re able to fill some of those needs in free agency then don’t rule this out. The Seahawks pick four times in the first three rounds and will have an opportunity to fill several needs in the first two days. Neal is explosive and hard-hitting and would be Seattle’s answer to Bucannon and Mark Barron. He can cover the slot too and possibly replace Kam Chancellor at strong safety one day. It’s the saddest story of the combine so far — but Notre Dame’s star linebacker is set to go from top-five lock to day three flier. All because he injured his knee in a meaningless bowl game. Pauline says he could last until rounds 4-7. Like Marcus Lattimore, he’ll get a chance to return. There’s also a realistic possibility we don’t see him until 2017 at the earliest — and will he ever be 100%? Pauline also says Jack Conklin is destined to go in the top-15, Le’Raven Clark is going to be a second round pick at worst and Mitchell Schwartz will command $8m APY in free agency. The line on Clark is interesting. Teams clearly love the potential but are probably petrified of the work he needs on his technique. If it clicks though you could be looking at an elite left tackle. The risk/reward could be appealing to any team with a good O-line coach. Here’s the key for tomorrow — look for edge rushers running a 10-yard split in the 1.5’s. Cliff Avril ran a 1.50, Bruce Irvin a 1.55 and Frank Clark a 1.59. Anything in the 1.5’s is elite. For the defensive tackles — anything in the 1.6’s is excellent. Aaron Donald ran a 1.59 split but he’s a freak of nature. The Seahawks would like to add a pass-rusher and while it might be interesting to look at some of the bigger-bodied guys and see how they move — this front office has preferred to draft base DT’s in rounds 3-5 or look to free agency. Quickness, agility, explosion. For all the depth on the D-line in this class there aren’t a ton of great interior pass rushers. Let’s see if there are any prospects with at least the upside to get there. I will update this post with highlights of the day. I’ll write a review article at the conclusion of the workouts. Today the quarterbacks, receivers and tight ends go through drills. We also get to find out defensive back measurements. Keep an eye out for cornerbacks with +32 inch arms — Seattle’s threshold for length. Assuming the Seahawks won’t take a receiver early — North and Lawler are two of the players I’m going to focus on the most. Russell Wilson ran an official 4.55 in 2012. Paxton Lynch had a 36 inch vertical. That equals Andrew Luck’s effort in 2012. Cam Newton managed a 35 inch vertical in 2011. It might be time to forget about Eli Apple and Mackensive Alexander. Both players have just under 31.5 inch arms — below Seattle’s 32 inch threshold. Here’s a list of some of the key names. I will include any defensive backs with +32 inch arms in bold. Of course Keanu Neal has identical size to Deone Bucannon and 33 inch arms. Of course he does. Legit first round talent. Neal is 6-0, 211lbs, has vines for arms and enormous 10.5 inch hands. Daryl Worley — 33.5 inch arms at 6-0 and 204lbs. Intriguing. Vernon Hargreaves confirmed he’s almost certainly exclusively a slot receiver. He has 30.5 inch arms at 5-10 and 204lbs. It’s a bad comparison, but people talk about him in the same breath as Joe Haden. Apart from major technical superiority, Haden also had 33 inch arms. Xavien Howard failed the 32 inch arm test. William Jackson’s arms are 31 and 3/4 inches — so I rounded it up. He’s borderline. Jermaine Kearse ran a 4.58 but was undrafted, while Paul Richardson and Tyler Lockett both ran 4.40’s. Group one above put in some pretty unimpressive times. Not a lot of speed on show here. No surprise that during the drills Tyler Boyd looked like the most natural receiver. Josh Doctson was a close second. Brandon Allen looked good throwing the ball along with the usual suspects in the first group of QB’s (Goff, Cook). Christian Hackenburg had issues with accuracy and was all over the place. Poor showing. Doctson had a 41 inch vertical and a 10-11 broad jump. Great day for him. Sterling Shepard also had a 41 inch vertical. Corey Coleman managed a 40.5, Marquez North a 35 and Michael Thomas a 35. Laquon Treadwell jumped 33 inches, Will Fuller 33.5 inches and De’runnya Wilson a terrible 28 inches. Coleman had a 10-9 in the broad jump, Fuller a 10-6 and North a 10-3. Marquez North’s unofficial 4.49 is excellent at 6-2 and 223lbs. Demarcus Robinson looks fast on tape but only ran a 4.59. His catching technique is horrendous. Duke Williams ran a pitiful 4.73. Not good. De’Runya Wilson ran a 4.90. What the…? Cardale Jones hurt himself during the forty yard dash. North looked really good in the gauntlet and drills — shows his hands to the QB and caught nearly everything. Sterling Shepard looks so natural out there — the comparisons to Tyler Lockett will continue to be made. Malcolm Mitchell made a ridiculous one-handed catch on a Paxton Lynch throw during drills. Carson Wentz looked really good throwing the ball but did have a couple of poor efforts. His footwork looked very good. Nate Sudfeld had a nightmare. Paxton Lynch grew into the day and started to look very comfortable. For no known reason, the biggest names in the TE class chose not to run. Athletic offensive tackles go early. While neither player quite got into Lane Johnson range (4.72 forty) they both impressed with a 4.92 for Spriggs and a 5.00 for Conklin. Both looked more athletic than Taylor Decker and could jump ahead of the Ohio State tackle on many boards. Expect both players to go in the top-20. Conklin’s workout was especially positive. Considered to be a limited athlete who might need to kick inside, he thoroughly dispelled that myth. When you consider he’s also a terrific run-blocker, a combo-block expert and he’s clearly a motivated individual (a former walk on at Michigan State) — it’s very hard to imagine he’ll get by Indianapolis at #18 and could be in play for the Eagles at #13. Spriggs is a more curious case. He’s the most athletic of the group but isn’t Johnson or Tyron Smith. There are some technical issues to work out (he gets beat inside way too much and can be shoved back into the pocket). The Jets at #20 could be a realistic home. We’re talking about more than just another productive running back from Alabama here. Mark Ingram ran a 4.62 at 215lbs. Henry smashed that time weighing 247lbs. He’s not Brandon Jacobs despite many attempts to force that comparison. Jacobs ran a 4.56 at 267lbs which is pretty staggering. They’re very different players in terms of running style. He appears destined to go in the top-40 at least. Is a team willing to take him in round one? He’s a fascinating, unique, intriguing player and a stunning athlete. After running a decent 5.13 in the forty, Glasgow had a nice outing during the drills. He moved very well in the mobility exercise and showed some power in the bag drills. The only area he looked uncomfortable was in the kick-slide — something he won’t have to worry about as a guard or center. Glasgow is nearly 6-6 and 307lbs with 33.5 inch arms. When you consider Jack Allen ran a 5.29 at just over 6-1, 294lbs and with 32 inch arms — there’s a palpable difference between the pair. It showed in the drills too. One looks like a third round pick and the other a later round option. Glasgow’s size will be too rich for some teams but he’s almost identical to Max Unger. He plays with a gritty attitude and earned widespread praise from Michigan coach Jim Harbaugh. He could be a nice option for the Seahawks at either guard or center. Stanford’s Outland Trophy winner played to the Seattle crowd during his press conference — stating it’d be a “dream come true” to play for the Seahawks. Garnett went to Puyallup High School and a return to his local roots might be on the cards. There’s nothing wrong with his tape but his conditioning has been questioned. As a run blocker there’s a lot to like and he’s plenty physical. At 6-4 and 317lbs with 33.5 inch arms he passes the eye test for a Seahawks left guard. He ran a 5.32 which is neither here nor there. It’s his work in the drills where he stood out. Garnett looked silky smooth every time he had to move around. He looked like a tremendous athlete considering his size. It’s hard to determine exactly what his range could be. I’m not convinced he goes in the top-40. Does he last until #56? That’s probably Seattle’s chance but how badly do they want to take a pure guard? Every starting left guard they’ve ever had has been a converted left tackle — Robert Gallery, James Carpenter, Justin Britt. They trained Terry Poole to make a similar switch. Garnett has what they like though — plus athleticism, a nasty streak, run-blocking skills and size. And he probably won’t be a Seahawk. After running a tepid 4.59 he managed only 28.5 inches in the vertical jump. That’s anti-explosion. Danny Shelton recorded a 30.5 inch vertical and he weighed 339lbs. He’s probably not going to fly down boards — he can still play. But he might be more of a late third or early fourth round pick. The Seahawks will almost certainly look for more explosion than this. It was fun watching Dahl and Nick Martin work together at the Senior Bowl and it’s a partnership I’d still be interested to see in Seattle. Dahl doesn’t jump off the screen — he’s subtle but extremely talented. He looks like an ideal right guard for the Seahawks. His combine performance also compares favourably to Mark Glowinski, drafted by Seattle in round four last year. LSU’s Vadal Alexander and Jerald Hawkins have been talked up a lot despite some extremely average 2015 tape. Both players had their pants pulled down by the Alabama offensive line and just seem to lack any stand-out features. Alexander is just a mediocre athlete who generates minimal push in the run game. Hawkins has average size, average athleticism and doesn’t look like a NFL left tackle. Alexander lost weight for the combine and still ran a humpty dumpty 5.57. Hawkins’ 5.23 is average — but his 10-yard split of 1.92 was only 0.04 seconds slower than Arkansas’ Denver Kirkland (who weighs 335lbs and ran a 5.55). It’s amazing that both players have been touted as first or second round picks as often as they have. Maybe the Niners will draft them early? Kenneth asked me in a recent podcast to name a running back that could go undrafted and still have an impact like Thomas Rawls. I suggested Georgia’s Marshall. He and Todd Gurley were meant to be the partnership to run the Bulldogs to a National Championship. It started well enough before the injuries kicked in for Marshall. By the time he’d recovered — Nick Chubb emerged as the legit successor to Gurley. On tape he had speed to burn. He ran away from defenders, could bounce plays outside and make terrific cuts and finish. With so many injuries you had to wonder if he could still light it up. Those questions were firmly answered today. Marshall ran a 4.31 at 5-10 and 219lbs with an elite 1.53 split. Chris Johnson ran a 4.24 at his combine but weighed 24lbs less than Marshall. Dri Archer ran a 4.26 at 173lbs. Think about that for a second. That’s the good news. The bad news is a mediocre 30.5 inch vertical. He’s quick — but is he truly explosive? The Seahawks seem to like lower body power and the ability to be more than just a fast guy. Thomas Rawls had a 35.5 inch vertical a year ago. Christine Michael had a 43 inch vertical. Who might they consider then? Notre Dame’s C.J. Procise ticks a lot of boxes. He’s 6-0 and 220lbs, ran a 4.48 and managed a 35.5 inch vertical. His experience catching the ball could also be crucial if they want to make him a third-down back. Louisiana Tech’s Kenneth Dixon ran an OK-ish 4.58 at 5-10 and 215lbs but did manage a 37.5 inch vertical. Marshall’s fantastic speed is intriguing — but Procise and Dixon are arguably the more explosive, tougher players the Seahawks look for. It’s hard to read too much into any of this — teams talk to loads of guys. Both Shaq Lawson and Emmanuel Ogbah said they met with the Seahawks. They tick the production box. Can they run a 1.5 10-yard split on Sunday? The linebackers are pretty long too. And look at the size. The D-liners and linebackers are big and long. All we need to see now are some athletic workouts. Who makes it into the elite class of 1.5 10-yard split runners? Who can flash explosive qualities in the vertical? On Sunday the defensive linemen get a chance to show the hype is justified. If you want a comp for Notre Dame LB Jaylon Smith's nerve damage — it's what Marcus Lattimore was up against when he came out. Medical testing is a vital part of the combine. A few weeks ago Smith was in contention, legitimately, for the #1 overall pick. He is/was that good. Now there is serious doubt as to whether he’ll play in 2016 or ever play football again period. What a cruel, horrible twist of fate. A’Shawn Robinson. When asked about how he can improve his pass rush production, he answered, “(I) need to stop patty-caking with blockers and make a play.” Kudos, sir. Future non-first round pick Robert Nkemdiche. Judge for yourself via the Seattle Times. Sometimes you’ve just got to take responsibility for a situation. Robert Nkemdiche says he was charged with drug possession because nobody in the hotel room "wanted to take the fall." Really. I continue to hear glowing reports on Keanu Neal. The Florida junior has been timing in the high 4.4s at 212 pounds and posted a vertical jump of 38 inches in training. He’s looked much better in combine training to this point than fellow junior Vonn Bell. The one red flag I’ve heard on Neal are constant hamstring issues that have plagued him, though sources tell me it’s a situation where Neal played through pain rather than ever letting the situation heal. I am starting to hear first-round grades on the safety and continually hear the names of the Arizona Cardinals and Pittsburgh Steelers as potential suitors in the first frame. The Steelers own the #25 pick — one ahead of the Seahawks. The Cardinals pick at #29. He’d make a huge amount of sense for Pittsburgh and he’s ideally suited for that defense. He’s equally well suited to the Seahawks too. And the Cardinals. And any other team interested in winning. According to Ian Rapoport. Carroll likely has a contract for life in Seattle. He’ll move on when he thinks it’s time. The key is to make sure John Schneider also gets a new deal too. I have a clear schedule for the next three days to do a live blog for the rest of the combine. Let me know what you want to see. Are you just interested in a few thoughts and all the numbers? Do you just want a review post at the end of the day? Or do you just want a place to chat in the comments section? Post any suggestions in the comments section. I’m busy with the day job today but will have a review post up later. I’ll update what I can in the meantime. My schedule is cleared for Saturday-Monday. For now feel free to use this as an open thread. They’ve switched it around this year with the running backs working out today with the offensive linemen. The tight ends will work out tomorrow with the receivers and quarterbacks. Laremy Tunsil has decided not to run at the last minute. Conklin is more athletic than people thought based on his performance in the forty. He isn’t going to last long in round one. Graham Glasgow looked good too. Some have suggested Vadal Alexander could be an early round tackle or guard. Along with team mate Jerald Hawkins, he’s one of the most overrated players in the class. Running an unofficial 5.56 and 5.59 pretty much confirms that. And he actually dropped weight for the combine. He labored in the initial movement drills. Fahn Cooper and Jack Conklin both looked very agile for their size. Taylor Decker looked incredibly stiff which was a surprise. Graham Glasgow looks terrific in drills. Quick, mobile. Jack Allen labored a bit and stumbled on one run. The difference between the two in terms of athleticism and size is palpable. Joshua Garnett also looked really athletic in the drills. In the kick slide drills, Fahn Cooper again looked good. Joe Dahl and Jack Conklin were a little more labored. Taylor Decker was a lot better here. Joshua Garnett again looked great and is having a great combine so far. Graham Glasgow didn’t look like a natural slider and appeared awkward. He’s very much an interior lineman. The defensive linemen have been weighing in. Andrew Billings was listed at 6-2 and 300lbs by Baylor. He’s actually 6-0 and 311lbs with 33 inch arms. Appalachian State’s Ronald Blair is 6-2, 281lbs and has 34 inch arms. Nice. He’s one to keep an eye on this weekend. Joey Bosa is 6-5, 269lbs and has 33.5 inch arms. Some nice length among the DL’s. Ogbah, Calhoun, Dodd off the edge. Let’s see if they’re able to run a 1.5 10-yard split. Darius Latham, William Henry, Jihad Ward, Vernon Butler, A’Shawn Robinson, Adolphus Washington and Chris Jones have vines for arms and great size. It’s no surprise that Shawn Oakman has incredible, stunning size. Ogbah’s 35.5 inch arms were not quite as expected. The length and size of the D-line class is the greatest characteristic of the group. Now we need to see who has the kind of agility and speed to develop into a NFL pass rusher. It’s been revealed Clemson cornerback Mackensie Alexander will sit out the combine. He has a hamstring injury. Receiver Pharoh Cooper also won’t run the forty yard dash. I’m heading to work now and will do some updates later, plus a review post. Use this as an open thread. I spent the night watching this guy and had to write something down. Keanu Neal (S, Florida) is a player. The Seahawks say they want to be the bully again. Well here you go. This is the reason I ended up watching Neal in the first place tonight. I deliberately set out to try and find a guy who best fits the term ‘tone setter’. There are a few in this draft — but not many with a supreme athletic profile, explosive quick-twitch athleticism, extreme tenacity and the ability to deliver bone-breaking hits. They’re going to lose, as Marshawn Lynch might say, “some dogs” this off-season. Lynch has retired, Bruce Irvin likely moves on. In 2013 they had guys like Chris Clemons, Red Bryant and Brandon Browner. Physicality, toughness, street-fighter style attitude. It’s hard to find guys like that within a group of rookies. It’s easier in free agency when you can dig out a guy like Tony ‘just take my lunch money’ McDaniel. If the Seahawks want to re-establish their attitude — Neal could be the answer. He’s tentatively listed at 6-1 and 216lbs. That’s only a few pounds lighter than LSU linebacker Deion Jones. Neal could play some ‘deathbacker’ like Deone Bucannon. He can play some safety. They can be creative with a guy like this. Bucannon was 6-1 and 211lbs at his combine and ran a 4.49. Let’s see if Neal gets into that speed range. There’s every chance — he was a coveted four-star recruit in High School. He gets up to top speed very quickly — he looks explosive. He can play the run up at the line and that shouldn’t be an issue despite his lack of size. And when he locks on to a ball-carrier — he’ll hammer the guy. He’s the type of player that can help the Seahawks establish that fear factor for receivers running across the middle. Get Kam Chancellor healthy and back to 100%, put him with Neal and it won’t be much fun at the second level. If you were going to write down a list of ‘best players’ likely to be available at #26, Neal has to be on there. And while adding this type of player might not feel like a priority at the moment — let’s see what they do in free agency. Drafting Neal is arguably the type of aggressive, physical, high-character, high-production, SPARQy move the Seahawks love to make in round one. Neal could also be an insurance hedge against Chancellor. Kelcie McCray is 28-years-old this year after all. If you’re thinking about a linebacker/safety for today and a starting strong safety for tomorrow — this could be an option. Like Bucannon in Arizona and Mark Barron with the Rams — you find a way to get the guy on the field. In all honesty he might not even make it to #26. Atlanta at #17 and Washington at #21 could be surprise options. Minnesota and Pittsburgh could also show interest. Keep an eye on his workout on Monday. If he runs in the late 4.4’s like Bucannon — watch out. Don’t forget to check out Thursday’s combine notes from earlier. 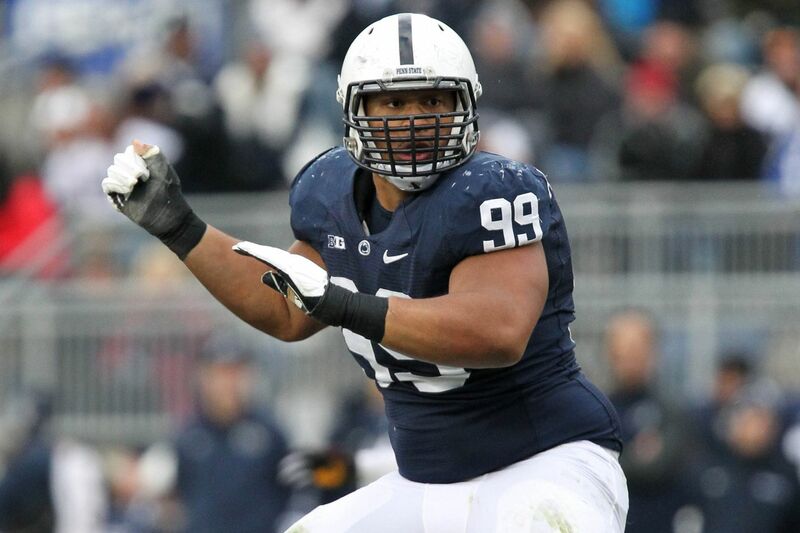 Penn State’s Austin Johnson — good at Kung Fu but can he rush the passer in the NFL? I want to pin it down but I can’t. Maybe the combine will shed some light. Who is the defensive lineman this team would consider taking at #26? It has to be a pass rusher. Surely. And yet beyond Sheldon Rankins it’s hard to imagine who they’d take in round one to fill that role. It’s interesting to see how the media is viewing Rankins. Daniel Jeremiah ranks him as the 27th best player in the draft. Lance Zierlein also has him as the 27th best player in the draft. Jeremiah mocks him at #12 to New Orleans however, while Zierlein has him going to the Seahawks at #26. I don’t think anyone should expect him to be there at #26. Pundits appear unwilling to label him a legit top-15 talent — but that’s the range he seems destined to go in. It possibly confirms that while it’s a good draft for defensive tackles — it’s limited in terms of pure interior pass rushers. Rankins might only be a late first rounder based on overall talent — but because he flashed legit quickness and pass rushing skill at the Senior Bowl, he’ll go much earlier. There are good DT’s available in this class but who are the six-sack types? Let alone the ones likely to push up towards double digits like Aaron Donald or Kawann Short? It’s why the depth of the class might play into Seattle’s favour. Ronald Blair III had eight sacks in 2015 and flashes the ability to get into the backfield. Do they wait and take him in the middle rounds? Do they consider a Darius Latham? A player with plenty of upside and athleticism but as a second or third rounder maybe doesn’t carry the pressure of needing to have an instant impact? Where does Adolphus Washington fit into this class? Late first? Second round? Third round? Austin Johnson and Willie Henry had seven sacks apiece in 2015. What range do they fall into? Is Jonathan Bullard a better athlete than he appears on tape? Is Chris Jones capable of taking the next step as a pass rusher or is he better suited in run defense? None of this speculating gets us any closer to working out who might be an option at #26. And while it would be appealing to tap into this DT class early — they simply might find a more impactful player at a different position. The depth of the defensive tackle class doesn’t force them into a corner. It’s perhaps why Pete Carroll remarked (and I’m paraphrasing), ‘we’ll see what happens in the draft’ when asked if he wanted to add a pass rusher. It might be their intention — it just might not be that easy to execute. This is a decent draft class. It’ll give you an opportunity to find role players right into day three. Many teams will find impact players in rounds 1-3. Some of the key positions of need for Seattle are also some of the stronger position groups this year. D-line, O-line, running back. There are some options there. There’s a tendency to focus on #26 and feel that the pick has to be saved for the #1 need. The top need might be better addressed in round three if that’s where your guy is. A good example of this is at linebacker. The options aren’t great after the top handful leave the board. If the Seahawks view replacing Bruce Irvin as a priority, they might need to use their first round pick on someone like Deion Jones — knowing there will be options on the DL, OL and at RB in rounds 2-3. This kind of approach will be even more likely if they address their top priority — the O-line — in free agency. Seattle’s biggest need in 2010, 2011 and 2012 was a long term option at quarterback. It’s that way for every team until you find the answer. By 2012, after two years of filling, they waited until round three to draft Russell Wilson even though they viewed him as a first round talent. Why did they do that? Because that was the range where they could get their guy — and it allowed them to add Irvin and Bobby Wagner too. This is part of the process unfortunately. Medical checks, injuries. Coleman was hurt at the end of 2015. It might not damage his stock — he just won’t be able to improve it in Indianapolis. The results for the offensive linemen are in. Arizona State’s Christian Westerman — a top tip to star in this drill — managed 34 reps before cramp set in. That number led the group. West Georgia’s Dominique Robertson had 30 reps with 36-inch arms. Le’Raven Clark, who also has 36-inch arms, managed 18 reps in comparison. **Note** According to Tony Pauline, Jason Spriggs was credited with 31 reps but had two discounted. So how useful is the bench press for determining strength? It’s a slightly flawed exercise due to pure physics. A guy who weighs 315lbs has a significant advantage over a guy who weighs 285lbs due to a stronger overall base — even if most of it is fat. Lifting 225lbs at 315lbs is also not quite the challenge you might think for some of these guys. Most will be able to do at least one rep of their own body weight. Lifting 80-100lbs less than your bodyweight should be relatively straight forward for these prospects — especially since they’ve been benching for years anyway. It makes the whole thing more of an endurance test than a show of real power. Arm length is also a big factor. If you’re benching with 31.5 inch arms it’s a major advantage over a guy with 36 inch arms for obvious reasons (the weight has to travel further). It’s never a level playing field and as a consequence is more a test of stamina + power rather than pure power. Are there better ways to do it that are more specific for the game of football? For offensive linemen it might actually be a superior test to do reps in sets of three at a heavier weight — then rest — and go again until you can’t lift anymore. That would be a more accurate portrayal of the game where you deal in short bursts of power rather than long, sustained jolts. Lifting your heaviest weight for 1-5 reps would also be a better indicator of power. It would take away some of the drama though — and the combine is increasingly catered to a TV audience. Watching a guy do 40 reps on the bench is impressive — and for that reason it’s probably here to stay. Of the results the most alarming might be Sebastien Tretola’s. He has all the advantages set up to succeed here — size (314lbs) plus short arms (31.5 inch arms). He only managed 22 reps. This indicates he either has an issue with power or stamina or both. Conditioning could be an issue. Cody Whitehair’s 16 reps is also surprising and disappointing at 301lbs and 32.5 inch arms. Jared Goff (QB, California) only has nine inch hands. The reaction on Twitter has to been to play this down (because Goff is the ‘draft twitter’ favourite *shudder*). This isn’t going to break Goff as a prospect. He’ll almost certainly go in the top ten — probably with Carson Wentz and Paxton Lynch. Such is the demand for quarterbacks. However — it’s important not to forget that teams have certain ideals. And that can be anything — hand size, general size, mobility. I still think Memphis’ Paxton Lynch is going to be the first quarterback off the board to Cleveland. There just aren’t many human beings on the planet with 6-7, 244lbs size and the mobility and escapability that Lynch possesses. He’s terrific on third downs and he elevated a Memphis team that otherwise would have no shot against teams like Ole Miss. He also has 10 1/4 inch hands, by the way. A large portion of the league would’ve drafted Blaine Gabbert before Cam Newton in 2011. Not many would’ve taken Newton with the #1 pick. Carolina did because they identified a skill set they could work with and harness and they saw the way Newton elevated his team in college. Even if three quarters of the league prefer Goff or Wentz — it only really matters what the team at #2 thinks (unless someone moves up). Don’t count out Lynch being the top quarterback taken this year. Cal’s Kenny Lawler measured at 6-2, 203lbs and has 10.5 inch hands. His highlight reel is something special — numerous athletic, one-handed grabs. He makes the difficult catches look easy. More importantly — he’s a touchdown maker. He had 13 scores in 2015 and a touchdown per every 5.3 touches of the ball. It’ll be interesting to see how he runs and performs. He appears to have great suddenness and short-area quickness which is big for Seattle. Does he also have the long speed? And how does he test in the vertical? The Seahawks might be looking at receivers in the middle rounds and Lawler could be an option.